This style is a great choice for a contemporary cottage style kitchen. It’s simple, but quite elegant and goes well with white or lightly colored cabinets and granite countertops. If you’re looking for a timeless look, white subway tile isn’t a design trend that will phase out anytime soon. If you want to add more pizzazz, create a herringbone pattern with the subway tile. Glass tile is always a beautiful choice and you can find it in many different shapes, patterns and colors. If you love the look of the subway tile, but want to add a little more pop to your backsplash colored glass subway tile is a great option. Glass tile is beautiful because it’s color is subtle, making your backsplash appear almost transparent. If you’ve watched HGTV lately, you’ve probably seen this backsplash implemented into many homes. This unique rectangular mishmosh of tiles and colors has really become a popular trend in the modern kitchen. This style is definitely more of a show piece and will stand out against dark countertops and cabinets. This neutral backsplash is perfect for the traditional kitchen. Whether you’re going for a subdued tuscan feel or an elegant classic kitchen, this stone tile will top it off. If you like the look, but want to spice it up, you can play with the pattern, creating a diagonal or crosshatch design. These examples combine the best of both worlds. They both have the elements of a traditional kitchen paired with fun accents, adding texture and color to the backsplash. If you’re a fan of a bold look, colored backsplashes are definitely making waves in kitchens across America. From full fiberglass installations, like the one pictured above, to brightly colored porcelain subway tile, there are many ways you can get bold with your backsplash. If you’re still unsure of what style is best for your kitchen, don’t hesitate to give us a call. 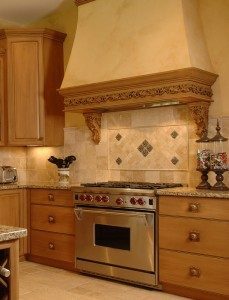 At Nu-Face Home Improvements we’re always happy to help with the design as well as the installation of your kitchen backsplash. Click here for a quote.